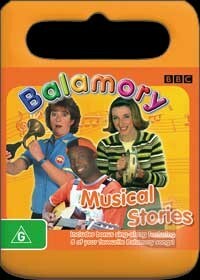 Roadshow have released another winner for the kids in Balamory Musical Stories that features our loveable favorites from Balamory. Unfortunately for our heroine Edie, she goes missing in a snowstorm while Spencer waits patiently... hoping that Edie will arrive soon in order to transport them to the Day Centre. Thankfully for the citizens of Balamory, this mishapen tale soon comes together thanks to the efforts of Edie, Spencer, Penny and PC Plum. It's a mystery, it's children edu-tainment and it's a healthy dose of music in this entertaining DVD that also features a myriad of special features which will have children singing, humming and dancing there way through this entertaining tale. Great stuff!